Note: This book is the second of the Kane Chronicles, following The Red Pyramid. If you have not yet read the first, there will be spoilers below. In The Red Pyramid, siblings Carter and Sadie Kane couldn’t be much more different. Carter, raised by their American father, has traveled the world, dresses like a junior executive, and has been extensively schooled in his father’s subject of interest: Egypt, specifically its mythology and history. Sadie, younger by two years, has been raised in London by their mother’s parents, loves pop culture and hanging with her mates, and making fun of Carter. They’ve been raised separately since the death of their mother, but now- just before Christmas- Dr. Kane has decided it’s time to bring the family together. Unfortunately, the ritual he enacts in their presence kills him and releases the ancient Egyptian gods, two of whom take up residence within the Kane siblings. Their Uncle Amos, their father’s brother, informs them that not only are they descendants of the ancient Pharoahs, but this bloodline makes them magicians. Magicians, of course, have to be trained, always a chancy prospect, especially when the training gets interrupted by little things like the world ending. Hunted by the House of Life, the organization of pharoah-descended magicians with nomes all over the world, Carter and Sadie have to team up with Zia, a House of Life magician with unique abilities; the goddess Bast, who’s been looking after Sadie in the guise of her cat Muffin; and any passing allies they can latch on to in their desperate trek to prevent Set from releasing Apophis. We pick up with alternating narrators Carter and Sadie a couple of months after the events of their first recording (the story is told as a transcription of an audio recording that was mailed to Rick Riordan). They’ve sent out calling cards across the world and attracted a little under two dozen students who they’ve been training in the mansion in Brooklyn while their uncle Amos recovers from being possessed by the evil god Set. It’s an interesting bunch they’ve attracted, but don’t get too attached- we see almost nothing of their students, something I fervently hope gets remedied in the next book. We get very fleeting references to what could be some awesome characters but the majority of the book leaves the students behind in Brooklyn. Though they successfully kept Set from releasing Apophis, the threat isn’t over yet. In five days, on the spring equinox when everything is in perfect balance, Apophis will break out of his imprisonment unless the Kanes can get the three scattered pieces of the Book of Ra and summon the ancient king of the gods from his retirement and very long sleep. The thing is, ancient has a bit more meaning when it comes to Ra- broken in mind and body, and thoroughly senile, Ra isn’t exactly the strong presence and king they need him to be, especially when the other gods are in conflict as to the proper course. Horus and Isis, especially, don’t want to see Ra take his former place on his throne of fire if it means they have to step back, and they’re not too thrilled with Sadie and Carter for forging ahead in their quest. We cover a lot of miles in this one: from Brooklyn to London to Russia to Egypt to deep in the Duat and back to Brooklyn again. In the space of five days. Portals are our friends, but it’s nice to see that there are limits to it. A portal has to cool down before it can be recharged again, which leads to some improvisation. That sense of limitations extends into everything. Sadie, especially, is very aware of these limits as pertains to her magic. She can do some AMAZING things, but the more she did, the bigger the oomph, the more it takes out of her. She doesn’t have the seemingly endless resources of Isis in her anymore, and when it comes right down to it, despite her dual-pharoah bloodline, she’s still a twelve (thirteen!) year old with barely two months of training. I’ll admit, the age thing trips me up occasionally. Sadie is supposed to be twelve turning thirteen, and Carter fourteen in a couple of months to be fifteen, but they don’t feel like it. They feel like they’re both around sixteen or so, not just in the way they talk and the way they look at things, but also in the way other people treat them and even just in the physical activity. Sadie’s an hysterical narrator, but she doesn’t sound like a tween. Well, excepts perhaps in the sometimes appalling insensitivy. I hurt myself laughing when it came to the camels, but I also felt absolutely horrible for laughing. You’ll see what I mean when you get there. Riordan does a very good job of weaving the backstory from previous books into this one (including private jokes from one series to another- cameo of Blackjack, anyone?). It’s gradual, so if you haven’t read the first book since it came out a year ago you may be a little overwhelmed at first as it starts right into a daring museum raid, but it weaves through the first several chapters so you don’t get an info-dump. We get the reminders about meeting Zia, about the last Chief Lector Iskandar, about Set (who, by the way, is ridiculously funny- kind of reminds me of DiNozzo from NCIS, only in better suits), and about Michel Desjardins, the new Chief Lector, and not particularly a friend of the Kanes. Though he allied himself with them to derail Set’s plans at the Red Pyramid, he still believes that their status as former god-hosts and their way of barreling into things without too much forethought make them dangerous enemies to the House of Life, even if they have no specific designs against it. Desjardins, though, has other problems. He’s become Chief Lector in time to see the dawn of a new age, an age marked in the hall of time by two men struggling against each other. He’s aging extremely rapidly (malevolent influences, anyone?) and at times he appears nearly as senile as Ra is reputed to be, his thoughts muddled and confused as he sorts through what he’s trying to think from what he’s being told. His…what’s the word here? Assistant? Toady? Stooge? At any rate, Vlad Menshikov, leader of the nome in Russia, is a seriously twisted dude, grandson of the infamous Prince Menshikov who was a close friend, and then reviled enemy, of Tsar Peter the Great of Russia. Menshikov may hear the orders from Desjardins, but he’s got his own agenda. 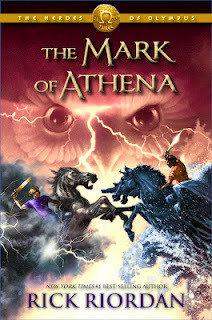 The two things that really mark any of Rick Riordan’s books are mythology and humor. Egyptian mythology is confusing at the best of times, but Riordan really lays it out in ways that make it easy to understand. He literally brings the gods to life. Bast is mostly occupied on a solo mission through this book, but she and her Fancy Feast are still around on the fringes, and Bes, the dwarf god, is absofrickinlutely amazing. He was responsible for some of the reminders that I should look away from the page before taking a drink- laughing and swallowing do not mix. Horus is drawn in an extremely compelling mixture of heroism and petulance. There’s a lot of good to Horus, but there’s also a great deal of ambition, greed, and the determination to keep what he has. Carter has to learn how to separate himself from Horus mentally, to separate out what he genuinely thinks is best from what Horus wants him to believe. No easy task. My most favoritest (used only for the most wonderful times) part? WEASEL COOKIES! Whereupon I remembered what it feels like to choke on popcorn and soda. For several minutes. Because I couldn’t stop laughing long enough to stop choking. There are certainly some heavy parts to the book- there are oh crap moments, and sad moments, and moments of incredible courage- but the humor brings us through it all. No joke, Rick Riordan is one of my all time heroes. It isn’t just because I love his books- though I do- but because they get people SO excited about reading. They race through his books and love them and they come to the stores wanting more, wanting to know what’s next, and if the next book isn’t out, they want you to point them to something else to read while they wait. As a reader, as a writer, as a bookseller, there’s nothing more amazing than seeing a kid that excited about a book. Teachers are able to use these books in their classrooms to get kids excited about lessons, to get them actually involved and doing things. It sneaks out from the books into the actual mythology, but then it goes into history and architecture and language and so many other things. Parents may complain- usually joking, but not always- about how much books cost, but most of them are so happy to see their kids wanting to read that it’s only a passing complaint. His books turn kids into readers. I still remember the book that made me a reader, and that’s a moment that never, ever goes away. The passion he creates in his readers changes lives. 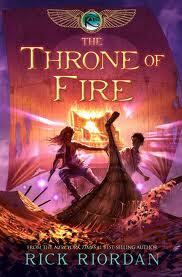 Throne of Fire, the second book in the Kane Chronicles, out in stores now! Clear an evening or afternoon for this one, because you’re not going to want to put it down. Kate Winters doesn’t want to spend her eighteenth birthday driving to a tiny Michigan town so her mother can die where she grew up. She doesn’t want to go back to high school and leave her mother in the care of a stranger during the day. And she doesn’t particularly want to make friends. Somehow, though, she ends up doing all of it, mostly because it’s what her mother wants. Her mother is dying. Has been dying. She’s held on for four years, longer than anyone thought she could, but now she truly is dying. But then, Kate meets Henry, a young man from the strange estate on the edge of town, and he offers her the one thing no one has even been able to guarantee: a chance to say goodbye. The promise that before her mother dies, she’ll be able to say goodbye. Henry and the manor are neither what they seem to be, and what happens over the long autumn and winter will not just change the rest of Kate’s life: they’ll change the rest of forever. I’m a sucker for Greek mythology. I always have been, probably always will be, and I jump on just about any new addition on it, so when I saw mentions of Hades and Persephone, I was bouncing up and down with excitement, couldn’t wait for it to come out. Now having read it… I don’t in any way mean to imply that I didn’t enjoy it, because I did, but I wonder if I didn’t get myself so worked up over it that it couldn’t ever do less than let me down a little. The myth of Hades and Persephone is, I think, one of the most intriguing of the classical stories, and open to such an array of interpretations. Their story here is intriguing, and sad- no, not just sad, profoundly depressing because it carries such a weight across so many centuries. Henry is such a complicated character, and yet he’s perhaps the most straightforward, the easiest to understand, and the one whose motivations are the more clear. His loyalty is staggering, as painful as it is commendable, and his hope is so fragile, so ephemeral, that each time we see it we want to somehow shelter it, as if there was any way we could. His grief is a living thing, a weight that hovers in the halls of the manor and shades every word. Sometimes the grief edges into rage, sometimes into despair, but even when he seems his most relaxed the grief is still a ghost at his shoulders, which is just so lovely. Eden Manor, not just the beauty of it but the fact of it reminds me of so many things I can’t say without fear of spoilers. The way it exists is a beautiful thing in and of itself, even separated from the story and the things that take place there. Setting so rarely gets to come alive and become a character in its own right, but the manor does just that. It is as essential as any person we meet, perhaps even more so than some, and that’s a rare thing. I love how consumed Kate is by her mother’s illness, how it overwrites every thought, every action, every moment until she’s just an extension of her mother’s cancer. It’s a very real thing, especially in a terminal sickness that holds on for so long. It isn’t just the patient that’s consumed by it, but those closest to them as well. Kate’s entire life, her whole world, is narrowed down to the single point of light that is her mother. She has no life outside of that, and I really liked that we get to see that. My mother is a nurse, and has been for some years a Hospice nurse, so seeing the truth of that reality- a reality of exhaustion and vomit and weakness- is amazing, and very brave. It takes a hell of a lot of strength to work day by day at someone’s bedside, terrified each moment will be the last and unsure if it’s hope or selfishness to believe they’ll make it another day, another week, another birthday, another Christmas, any milestone that can be clutched against the fear and the pain. It takes a very different kind of strength, and perhaps a more difficult one, to know when to let that go. To recognize the moment when you have to take your own life back, and find the courage to figure out what that life even is anymore. To see that in Kate was extremely compelling, and that more than anything else is what kept me turning page after page. There was a lot in this book to love, but there was also a lot that left me wondering if I’d somehow missed several very important things along the way. Kate’s friendship with Ava is baffling on nearly every level. I don’t want to give twists away, but Ava’s constant selfishness and unthinking cruelty make her an odd choice of companion and friend. To cling to the familiar- even if it’s not the person you would have chosen- is natural, but it feels forced, like Ava is only ever an albatross at Kate’s neck. She serves a purpose- she serves several purposes, as a matter of fact- but she also serves to muddy things. Given what Kate has gone through in the past four years, given the person she has become as a result of that, it doesn’t work for me that she would even tolerate Ava at some points. To mention the tests doesn’t give much away- they’re in the title, after all- but the nature of them was a little disconcerting. Jarring, I suppose, would be the best word for it. Kate is told upfront that there will be tests, that she may or may not know them before/during/after, but that she must pass all of them. She worries about them constantly, frets at them, and yet doesn’t recognize most of them. It leaves me with endless tension and no pay-off. As the narrator, she’s limited by her own knowledge, but I would have wished to see indications of the tests in those around her, those who do know what the tests are and how they’re played out. We get a lot of worrying and a lot of time passing, but we don’t really get to use those tests as intervals, or more importantly, as steps. The nature of the tests also startled me; it seemed strangely out of place, like we were somehow being asked to blend two very different mythologies. And here’s where I start dancing around things in the attempt to be honest without spoiling things. The ending was…I’m not really sure what the ending was. I was expecting both more and less, each in different ways, so it left me very confused about the direction the next book will go. Generally speaking, each book in a series leads to the next one. Obviously there are exceptions, especially an ongoing series that will end up with fifteen, twenty, twenty-six books in it, but even where the first books don’t end in cliffhangers, there’s something to pull you directly to the next one. And then promptly make you spend the next six to twelve months swearing like a sailor because you have to wait. I didn’t have that here. I’ll definitely read the next one, because despite everything that bothered me I really did enjoy it, but it’s not what I’ll be jumping up and down for, it’s not the one that I’ll be arguing over with other people trying to guess what happens, because I have absolutely no idea. There is nothing to indicate what’s going to drive the second book, and that, more than anything else I think, is what bothers me. As much as I hate the waiting, there’s pleasure in it too, having that sense of anticipation so that the relief of FINALLY having the book in your hands is as much a joy as the reading of it. I want that from my books. All things said and done, this book is an intriguing view of Hades and Persephone, and some of the characters are so real- and compelling- that I look forward to coming back to them. Are that pieces that bother me? Yes, absolutely. But not enough that I don’t want to continue reading the series. I’m still caught- the frustration of not being able to wonder where it’s going is only so sharp because I want to know. 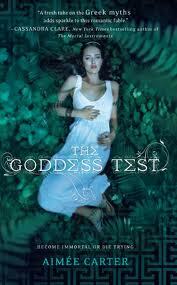 The Goddess Test, by Aimee Carter, available April 19th, 2011.